Sanrensei is one of the most basic fuseki patterns these days. However many people get into the habit of plunking it down thoughtlessly, and as a result many have come to dislike it as a "cop out" pattern that leads to boring play. I was of this opinion for a while, then I started to take a serious look at professional games. Takemiya Masaki often plays the sanrensei fuseki and in studying his games I have gained a fresh appreciation for this opening. Takemiya has developed some very interesting and unique ideas that I believe are worth studying and have made this opening more interesting. This page is the culmination of studying dozens of openings from Takemiya's games with the hope that it can provide some new and interesting material for the reader's games. Takemiya has developed a unique joseki that generally only works well with the sanrensei pattern. I've called this Takemiya's Kosumi for lack of a better idea. This move is b in response to the approach at a. Another response to the approach at a is to play tenuki at c (yonrensei). This move is a little more widely played by other pros, however the earliest instances of it I found were in Takemiya's games. Uwe: Sorry Takemiya Masaki has never developed this gorensei (five star points) to this rokurensei (six star points). http://www.gobase.org knows four games with this gorensei pattern. In none of these was Takemiya Masaki involved. 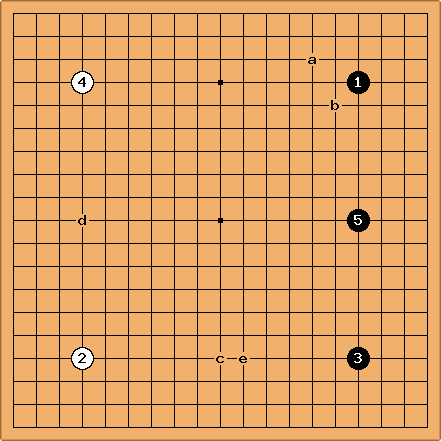 I know of only 13 games with this rokurensei where Takemiya Masaki was playing the white stones (but there are many games where he had the black stones). In 11 of these 13 games he played at a (and lost all), in one he played at d and so made another gorensei (this game he won). In the last one of these 13 games he played at e (and he lost again).